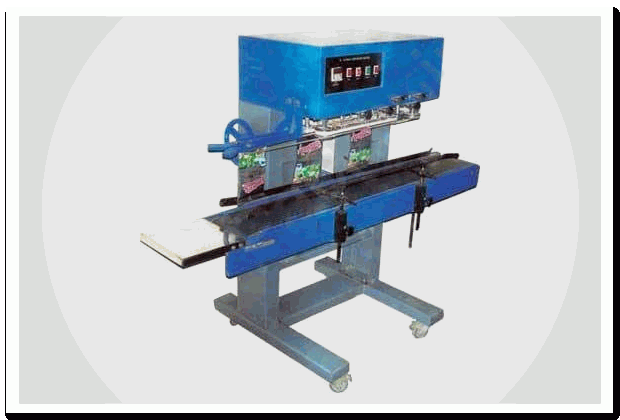 Continuous Band Sealing Machines|manufacturers and exporters in Mumbai, India. Owing to extensive experience, we are a leading supplier of high performing continuous band sealers that are suitable for small bags packaging up to three kg bags. Further, the products are praised in the market for their robust construction, consistency and long lasting nature. Featuring adopt electronic constant temperature control system and step less speed adjusting transmission mechanism, these are extremely efficient. Continuous Band Sealer is made of premium quality materials for optimum utility and accuracy in application. These can be customized as per the needs of the client and are known to have long performance life. These products are widely used in various industries and sectors for diverse applications. These are available in various sizes and designs at most competitive prices to fulfill their exact requirements and demands. We offer them with quality material to ensuring defect-free delivery of products to our customers.